Sheltay Retrac was an aide to Bail Organa at the end of the Clone Wars in Revenge of the Sith. After her death, Retrac’s daughter Winter was adopted by Bail and Breha Organa who raised her alongside their other adopted daughter Leia Organa. Sheltay Retrac (played by actress Caroline de Souza Correa) had a very small role in Revenge of the Sith. Here she is below walking behind Bail Organa near the end of the film. Revenge of the Sith was Retrac’s only canon appearance. Her life was much more full if you dive into Legends materials. 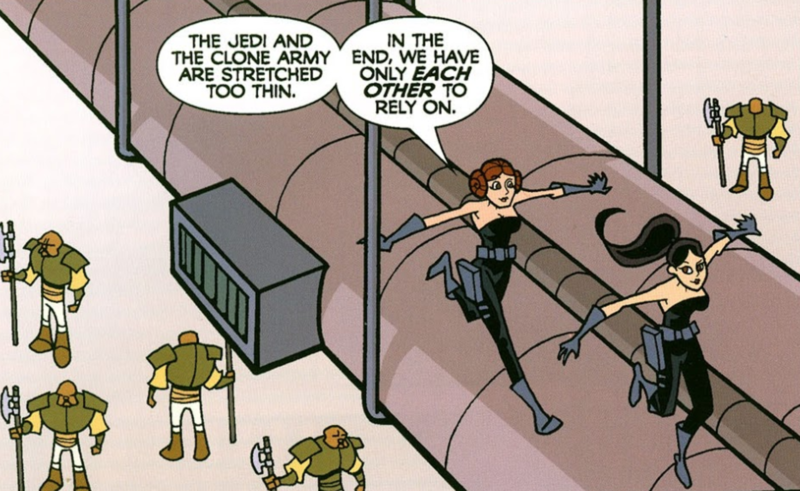 She appeared in two stories that were in Star Wars: Clone Wars Adventures – “Bailed Out” in Volume 5 and “Spy Girls” in Volume 7. She had different looks in both stories. Retrac also appeared in James Luceno’s novel Dark Lord: The Rise of Darth Vader.